Click on each photograph below to see it in larger size. It’s summer in the Antarctic and on sunny days I can venture out onto the bow of our Sea Shepherd vessel, the Bob Barker, to let the warmth penetrate my bones. 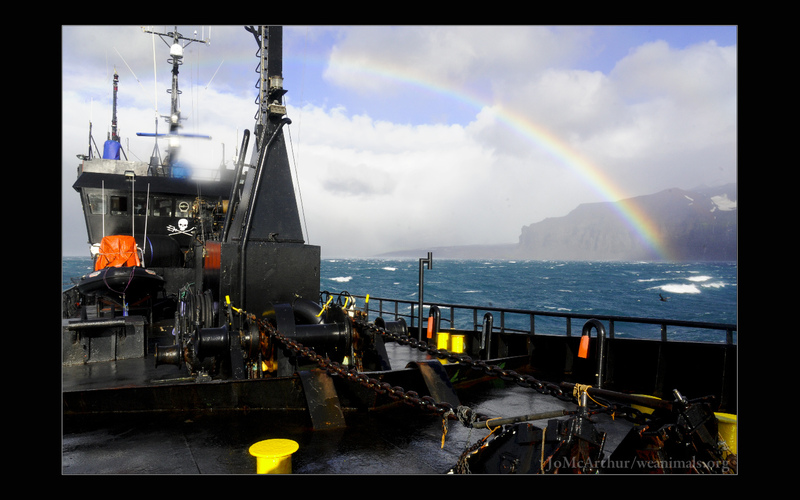 Between chores, the bow is a great place to spend a bit of idle time outdoors reflecting on life and on our mission here in the southern oceans. Keep a sharp eye and you’ll spy dolphins, penguins, albatross, and southern petrels. These moments of quiet reflection give me time to reflect on how the heck I got to be on this boat of environmental and animal rights activists, and on how a few defining life decisions led me to this moment. 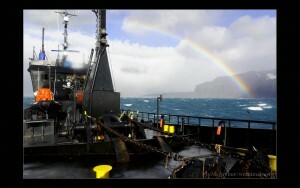 A beautiful but wet day on the Antarctic Ocean. Bob Barker captain, Chuck Swift, gives orders to crew in an intense moment while being surrounded by the Japanese whaling fleet. The whalers hunt under the transparent guise of “research,” and though the countries who are members of the International Whaling Commission have imposed a ban on whaling in this southern sanctuary, no one is there to enforce the ban. Long time radical animal activist Paul Watson decided to take the matter into his own hands, sending ships down to the Antarctic to intercept the slaughter of these endangered animals. My title on board The Bob is “Sea Shepherd Crew Photographer.” It’s a role I almost turned down in lieu of a much-needed restful winter in Canada. When I think about a “fabulous” experience or moment in my life, he story of how I came to be on The Bob is one of those. I am a photojournalist and the work I do for animal rights is rewarding and exhausting. The year 2009 was undoubtedly the craziest of my 33 years. It began with a trip through Guatemala and Belize, followed by three months in Africa. A volunteer shares a moment with a rescued chimpanzee. While shooting a photo story at a primate sanctuary in Cameroon, I contracted dengue fever, which left my body crippled with reactive arthritis. 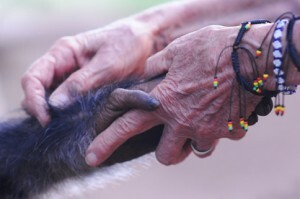 Refusing to return home for a rest, I moved on to Uganda to do photo work with the Jane Goodall Institute. There I asked a doctor to load me up with the meds necessary to allow me to continue my work. These meds were steroids, and I relied on them for close to four months. They helped me to walk and work, but slowed my overall healing significantly. After a brief rest in Canada, I left for Spain and France to do factory farm investigations and a story about the brutal slaying of bulls during La Corrida. 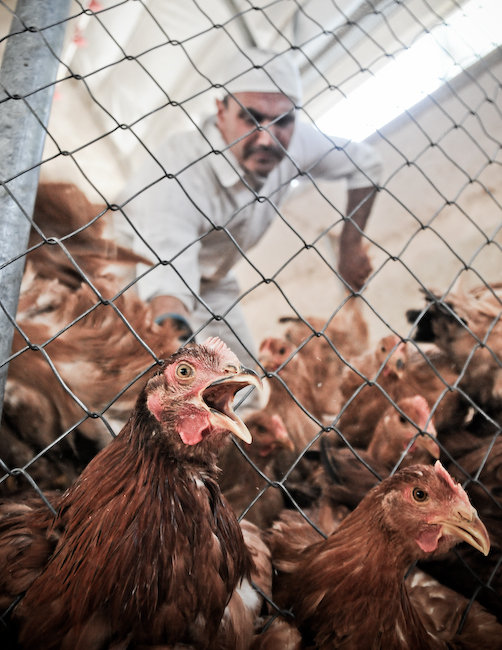 Night after night, with cameras in hand, I traipsed all over the country to document the extreme suffering of pigs, broiler chickens, egg laying hens, and bulls. From there I went onto Scandinavia where I documented mink farming. It was incredibly exhausting work, in both the emotional and physical sense. The traveling and all-night investigative escapades left me drained in a very profound way. 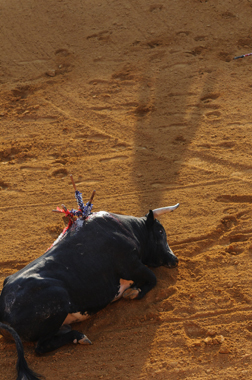 Thousands of bulls are needlessly killed each year in Spain’s Corrida. I do all of this investigative work so that I can help expose the use and abuse of animals worldwide. The images I take have become part of my umbrella project on the subject matter, called We Animals, and dozens of animal welfare organizations use the images to promote their work. We Animals is my passions combined: my love for story-telling through the lens and my love for helping animals, seamlessly entwined, epitomizing that famous quote by the writer Kahlil Gibran, “Work is love made visible.” I feel very strongly that my work for We Animals is what I was born to do in this lifetime. I took action to solidify this belief when I wrote to Sea Shepherd that November. Free range chickens are collected, six at a time, by their legs, and put on the truck headed to slaughter. The Sea Shepherd mission came on the heels of my European investigative work so I put off replying to them as to whether I would join. The opportunity stood before me as a chance of a lifetime: saving whales, visiting the Antarctic, living on a boat, working alongside other dedicated activists … incredible! Yet I knew that I had to say no for the sake of my recovering health and my sanity. I wrote a carefully crafted e-mail, saying that I would love to join future campaigns, but would regretfully decline this upcoming mission. I sat there at my computer before hitting “send,” feeling responsible but hollow. As I navigated my mouse to the “send” button, however, something happened. I quickly deleted that email and, with a smile and a sigh, wrote the words “Sign me up!” I hit send. My fate was sealed. 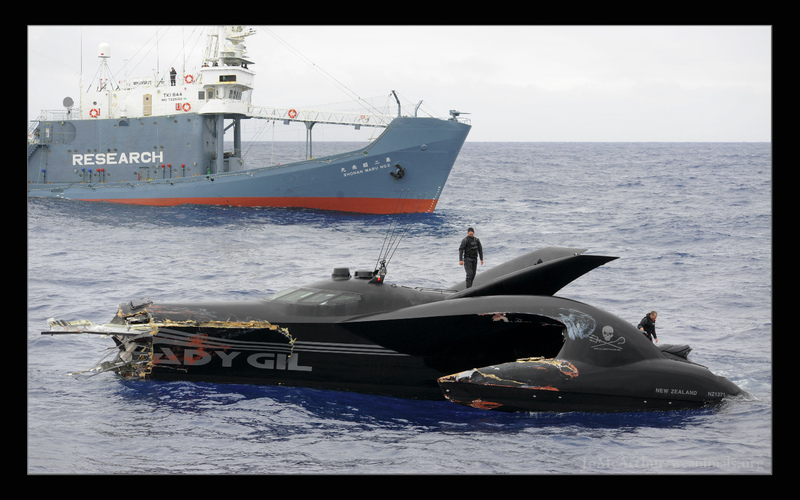 The Ady Gil, moments after it has been rammed by the Shonan Maru No.2 The boat sunk less than 48 hours later. All crew members escaped. 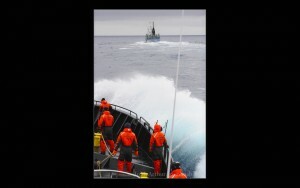 My “yes” to Sea Shepherd was a door thrown open wide. I felt like I was also staring down a dark abyss of danger, seasickness, and sleep deprivation. It was all that and so much more. Not only did I have the adventure of a lifetime with inspiring activists and work that was meaningful to me, but my photos were also published by over two thousand news agencies worldwide. Though I was working for Sea Shepherd for free, it turned out to be a decent career move while helping to expose the poaching of whales in the southern oceans. I’m happy to report that my Sea Shepherd mission only somewhat slowed my recovery to full health. The dengue-induced arthritis lingers, but I have made a full recovery. When I finally caught my breath after that whirlwind twelve months, I was sure that things would slow down and that there’d be calmer waters ahead. Actually, though, that whirlwind hasn’t really stopped. Since that year, I have travelled to dozens more countries and worked with many inspiring animal protection groups to document factory farms, wildlife sanctuaries, puppy mills, captive animals, fur farms, slaughterhouse vigils, animal fairs, and more. I have written two books and, with Dr. Keri Cronin, launched the Unbound Project to highlight the work of women on the front lines of animal advocacy. Little did I know that in 2009, I was just getting started. In documenting our complex relationships with animals, I see the best and worst of humanity: the willingness of so many to look the other way in the face of atrocities, and the refusal of some to turn away. The work I do is can be difficult and devastating. I’ve shed more tears than I thought possible over the cruelty, hopelessness and apathy that I have witnessed. Not being able to save the tens of thousands of animals I’ve met causes me a lot of heartache too. Yet every moment of injustice and suffering that I have captured serves a purpose. My images have been presented to government committees examining industry practices. They have been mounted on billboards seen by millions of people. They have been featured in countless exposés highlighting practices that would otherwise remain in the dark. The work is hard, yes, but the suffering of those animals is not lessened by our not seeing it. Change will only come with visibility, so I continue my work to make sure these beings are seen. On the other side of what I do are the rescued animals. And the activists who give––and risk––everything to make sure that those animals know that despite everything they have been through, they’re safe now. They’re loved. My work for animals is my love made visible. 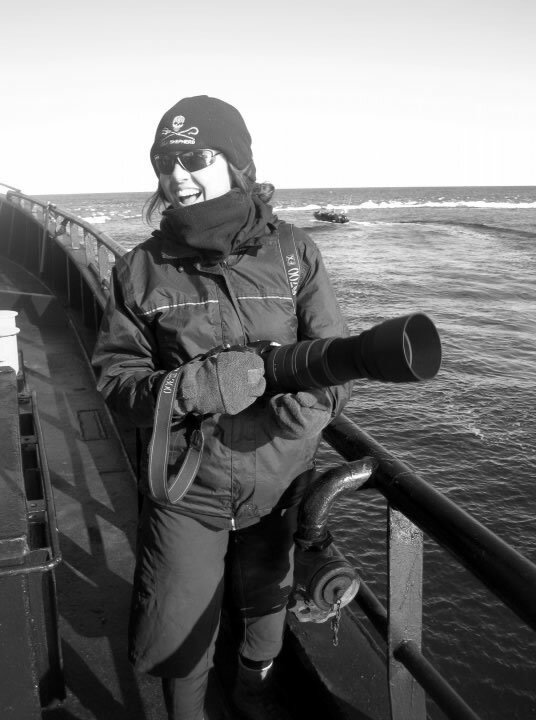 Jo-Anne McArthur is an award-winning photojournalist, author, educator, and animal rights activist. Her documentary photo project We Animals explores our uses, abuses, and sharing of spaces with the animals of this planet. She is featured in the award-winning documentary film The Ghosts in Our Machine and has written two books, We Animals (2013) and Captive (2017).